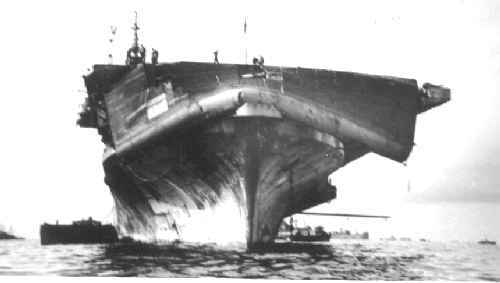 On 5 June 1945 the carrier was damaged by a typhoon off Okinawa and retired to Leyte for repairs, arriving 12 June. Here is an eyewitness account from Don Fitzgerald, in Chico, Ca. You guys bragging about water over the bow, look what the typhoon did to CV-20 in 45, can you top that?? Hope no one ever has to. That was some experience when it tossed the ship around like a match box. starboard engines full astern and our port engines full ahead just to keep the island into the wind to keep from capsizing. The stress and strain in the engine and the vibrations was like standing on a vibrating machine. FOR PERIOD 6 AUGUST 1944 thru 15 SEPTEMBER 1945.
storm known to be approaching from the south. Ship in Typhoon Condition Two. Set Condition Zebra and Typhoon Condition One at 0423 hours. Wind increased in velocity to 60 knots at 0507 hours. 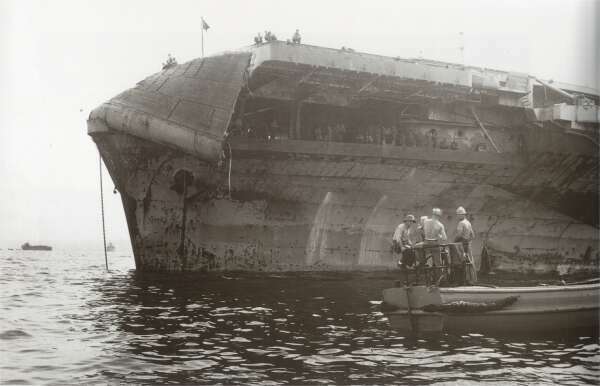 At about 0528 - the forward 25' of flight deck collapsed due to heavy pounding of the seas. 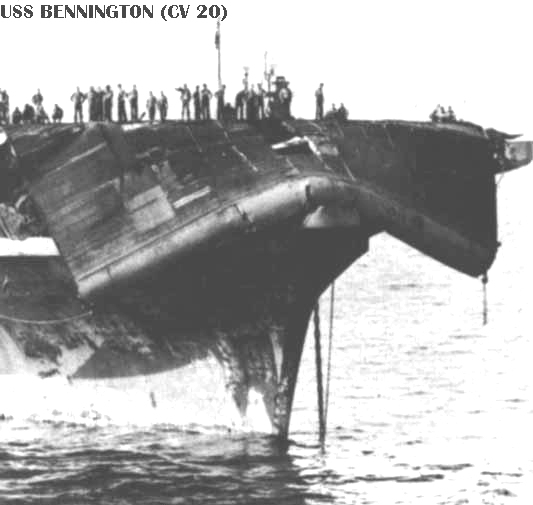 BENNINGTON passed through the center of the storm at 0700-0730 hours. during 10 July - 15 August took part in the final raids on the Japanese home islands.